The Office of Scientific Training, Workforce Development and Diversity (STWD) at Wayne State University seeks to engage people from diverse backgrounds and help them to prepare and succeed in science, technology, engineering and mathematics (STEM) and medicine. This lays the foundation for eventual transformation of the STEM workforce through implementation of successful training and mentoring strategies supported with grant funding from public and private sources. The long- term goal of STWD is to create a diverse and robust workforce comprised of individuals from all population groups. 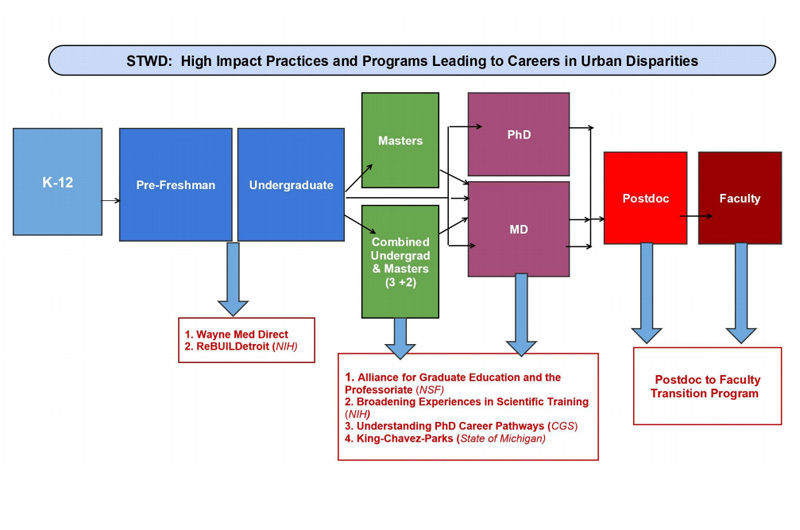 The STWD positions Wayne State as Southeast Michigan's hub for training programs using a training continuum model to drive the pipeline from K-12, undergraduate, post doctorate and early career faculty. Through grant funding and institutional commitments, the program leverages Wayne State's research enterprise and faculty expertise to enhance the recruitment, retention and advancement of talented scientists and thinkers from a diverse pool of individuals. STWD is housed within the Provost's office and receives additional support from the Office of the President, Office of the Vice President for Research and all 13 of Wayne State's academic deans.